Sorry, that’s just the way it is. But lord knows this world is full of fools, and many of them seem to shop at luxury department stores. 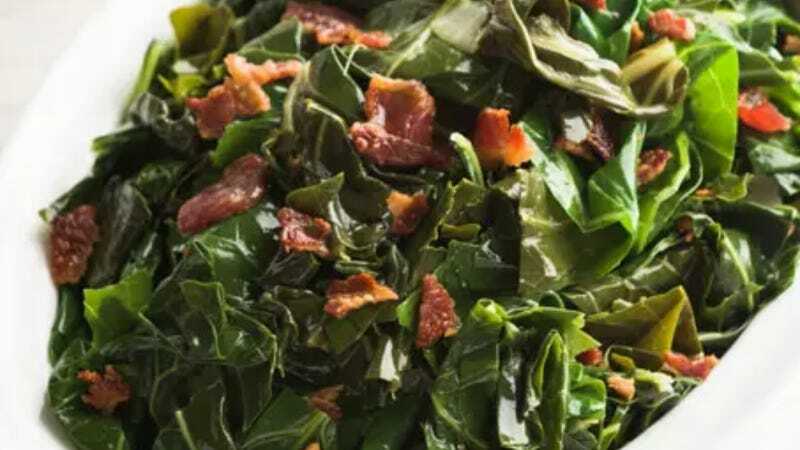 Detroit’s Metro Times points to the fact that Neiman Marcus has prepared food offerings as part of their home store, which includes $66 collard greens—plus $15.50 for shipping—“seasoned with just the right amount of spices and bacon.” You get four 12-oz. trays, estimated to serve 8 to 10 people. Oh, and they ship fully cooked and frozen. Is “just the right amount of spices” code for “literal gold”? This isn’t the first time the luxury retailer has taken to gentrifying an otherwise quintessential comfort food (and, I’ll say it, a dish traditional to people of color). Last year, we scoffed at the equally ridiculous tamales for sale at $92, plus shipping. The “deal” (still available, according to the website) includes a mere 72 tamales available in your choice of beef, chicken, pork, or assorted. Hello, last time we made tamales with family, each relative was sent home with that many. The collard greens offering has inspired the hashtag #gentrifiedgreens, with plenty of people deriding the retailer for its cluelessness. Also available: broccoli cheese casserole ($80); “traditional” cornbread dressing ($85); a baked bean medley ($80); and green bean casserole (a comparatively affordable $52). But if you spend $350, you’ll qualify for a gift with purchase of “FREE TOTE + TREATS,” so you can tell on yourself without saying a word. For future reference, if somebody is selling you $66 worth of collards greens, they ought to fill up the trunk of a compact car (cooked) or the back of a pickup (uncooked). It should be enough to feed an entire family reunion. Otherwise, someone has played you, and by not knowing any better, you have played yourself.